The U.S. is already hinting at additional sanctions following the medium-range ballistic missile tests. North Korea fired two mid-range ballistic missiles off its east coast early Wednesday morning, according to South Korea’s military. “North Korea fired a ballistic missile at 2:35 a.m. and another at 2:45 a.m. from the Sukchon region, north of Pyongyang, into the East Sea,” Yonhap News Agency quoted a South Korean military official as saying. 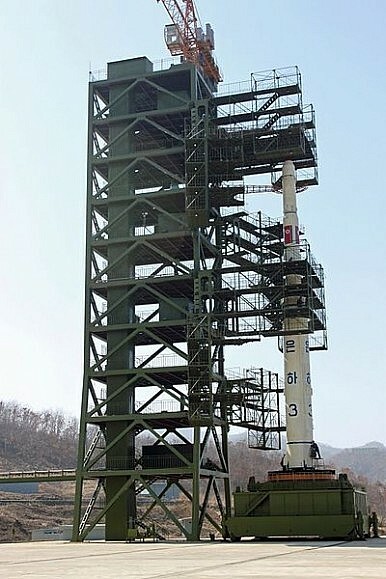 The missiles, which were believed to be of the Rodong-class (Nodong), traveled 650 km in the direction of Japan before falling into the Sea of Japan. If accurate, this would make it the longest range missile that North Korea has tested since December of 2012, which preceded North Korea’s third nuclear test in February 2013. It would also be the first time that North Korea tested a Rodong-missile, which is believed to have a maximum range of 1,000 km, since July 4, 2009. That was a few months after North Korea’s second nuclear test. Pyongyang also tested the same missile in July 2006, a few months before its first nuclear weapons test. As the U.S. statement notes, the missile tests on Wednesday come in the aftermath of much less provocative missile launches from North Korea in recent weeks. Those earlier missile tests were believed to be in response to annual U.S.-South Korean military exercises, which Pyongyang vehemently opposes. On Monday, North Korea’s deputy UN ambassador warned the U.S. that continued hostility on its part would force Pyongyang to take additional measures “in order to demonstrate the power of the self-defensive nuclear deterrent.” The launch of the two ballistic missiles on Wednesday, however, appeared to be timed to coincide with a trilateral meeting between the leaders of the U.S., Japan, and South Korea. The three leaders were scheduled to meet on the sidelines of the Nuclear Security Summit in the Netherlands. Earlier in the summit, Presidents Xi Jinping and Barack Obama held a meeting, where they discussed the North Korean nuclear issue. Today is also the anniversary of North Korea’s sinking of the South Korean warship, Cheonan. The act was widely believed to have been carried out on the direct orders of Kim Jong-Un in a bid to boost his credibility with the North Korean military ahead of his expected takeover of the country from his father. Notably, the tests occurred a day after Choe Son-hui, North Korea’s deputy chief to the Six-Party Talks, arrived in Beijing to discuss restarting the talks with Chinese officials . The ballistic missile tests are likely to further infuriate Beijing, which has become increasingly frustrated with Pyongyang in recent weeks even as it continues to engage diplomatically with both the Koreas in order to revive the Six-Party Talks.